Extra precautionary measure to keep your vehicle swirl and scratch free! The Grit Guard Insert has revolutionized the way car care enthusiasts around the world wash their cars. The Grit Guard Washboard, which is designed to be used in conjunction with the Grit Guard Insert, takes this concept a step further by releasing and trapping even more harmful dirt and grit particles. This simple and effective combination of Girt Guard Insert and Grit Guard Washboard protects your precious painted surfaces from being scratched and swirled during the wash process. What’s in YOUR bucket? 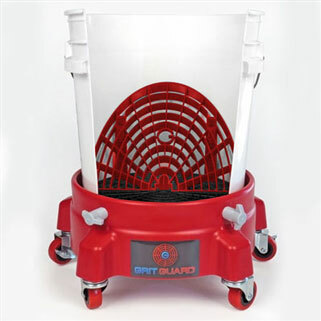 The Grit Guard Washboard works in conjunction with the Grit Guard Insert in your wash bucket to separate the grit from the mitt! 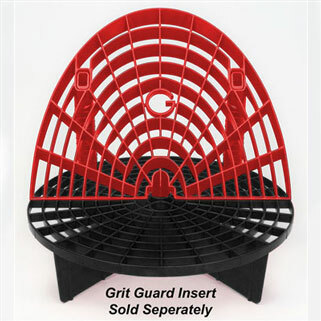 Like its sister product, the Grit Guard Insert, the Grit Guard Washboard has NO flat surfaces for dirt or grit to be collected. Contaminants are extracted from cleaning tools while rubbing them on the downward stoke against the Washboard. Particles such as dirt, grit and grime from your wash mitt are the root cause of scratches and swirls in your vehicles finish. By using the Grit Guard Washboard together with the Grit Guard Insert you are ensuring a clean, scratch-free wash mitt every time you go back to the bucket for water. Some pictures show the Grit Guard Insert (in red), which is not included, but required for fitment of the Grit Guard Washboard. Very useful for removing grit from wash mitts and the many kinds of brushes where the bristles don't face the bottom of the bucket. Great Idea and addition to the Grit Guard. Yes, I know the Washboard has been around for a while now, but I never thought about ordering it until I was washing a car. It's a great idea and keeps me from having to dip my wash media all the way down to the grit guard. Worked like a dream! Wouldn't do wothout them now!! !